When you are an aspiring writer or a student, the process of research can be very beneficial. It will allow you to explore and fire up your imagination like never before. But sometimes we get too absorbed in the preparation process so we tend to procrastinate writing the piece itself. Perhaps you are too intimidated by the work ahead so you romanticize the research and get stuck in the loop? Or you have no idea where to begin? If you prolong the study of the collected materials, you will likely end up with too much information that might take over your entire work. So when is the right time to end your research and actually start writing? So let’s say that you are deep into your research and clicking on every link available. After some time, the information you already collected will start merging together and you will not learn anything new. This is the right time to stop and take a step back. Start by asking yourself if a text is worth reading, is the source credible, and would it be useful to you later on. And always remember that you can bookmark something and return to it when needed. If you are still not confident enough to finish your research, you can use gaps in your text and fill them out later. 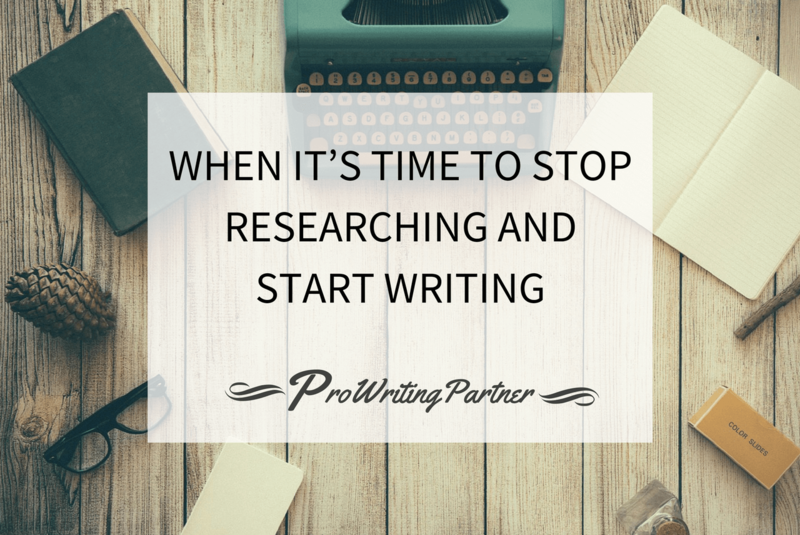 This is the best way to break the plateau and start writing without finishing the research process itself. You will be productive, complete your daily goal, and fill out the blank spaces once you are done. This is especially useful for academic students because you will not miss your deadline and have correct information in your paper at the end. But don’t forget to write down your sources because they will be easier to find once you start revising your paper. Whether you are stressing about the approaching deadline or the launch of your blog, you need to relax and focus on the work you have in the present. Thinking about the future events and diving deep into the research without writing a single word will not get you out of your comfort zone. So take it slowly and go easy. You have probably created an outline of your project so go one step at a time. If the deadline is just around the corner, you will not produce excellent or outstanding work if you are in a constant state of dread. If you are working on a fictional piece, the chances are you will have to combine writing with the research. The best way to do so is by creating a schedule which will limit the time you spend on exploring different locations or character traits. Therefore, you will not be tempted to go into the procrastination mode. An hour a day will be enough if you are not a full-time writer with set deadlines. Once the time is up, start writing your story. And make sure you remove any distractions such as social media during your creative time because you are supposed to immerse yourself in the process without constantly checking your feed for updates. Research can be tiresome and after you spend hours and hours staring at a screen, you will probably feel sleepy and not fit for writing a single word. This is your brain telling you that it is time to stop researching and move away from your computer. Get some rest, sort out your ideas while drinking a hot beverage in the morning, and try to write afterward. Your brain will function better after you catch some z’s and your creativity will peak in the early hours of the day. Plus, a couple of hours of sleep might even help you come up with fresh ideas you will be able to use later in your story. Freewriting is a technique that might be the perfect transition between the research and actual writing. You can use it to break the ice and get rid of the fear of starting. Simply listen to the flow of ideas swirling through your head and write them down as they are. Don’t pay attention to grammar or spelling because the goal is to get some of your thoughts and information you have gathered written on a piece of paper. This will get you moving in the right direction and you will be able to determine if you are ready for the real work. If you feel like continuing, sit in front of your computer and start typing. Making a brief outline right after you complete the research is crucial. It will help you gather up the collected information and allow you to have a better overview of the work you have ahead. You can either use bullet points or focus on the most important parts of an essay, depending on the type of text you are writing. An outline will make you stay on track and allow you to create a useful writing schedule that will improve your productivity. It can also pinpoint the parts you have to work on more or revise with fresh ideas. Each writer has a different research method – some like to travel to foreign lands while others will view different destinations from the comfort of their homes and collect as much information as possible in their notebooks. But is there a right time to stop and start writing? Research might seem like a never ending task so the best thing you can do is dive into the work and fact check as you go. Combining these two activities might seem impossible but it will get you into the mood for writing which is great if you have a deadline. Of course, don’t even attempt to start writing before you do your research because you will very likely get lost and discouraged. So good preparation is crucial in this situation but try not to overthink it and start procrastinating. What Is Greek Life in College?